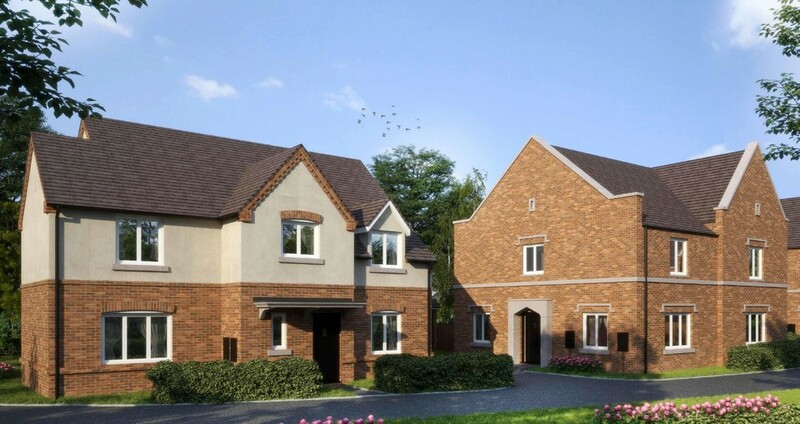 An exciting new development of 9 detached and semi-detached homes boast an energy efficient, bespoke specification that include high quality en-suite bathrooms and spacious living areas. Plot 9 comprises kitchen/family area, utility room, lounge, study, cloakroom, four bedrooms, two ensuites, family bathroom, gardens and garage. Specification for Lower House Gardens, Far Moor Lane, Redditch. 3. Stainless steel one and a half bowl under mounted sink with engraved drainer and chrome plated mixer taps. 4. Eye level double oven, 5 ring burner gas hob and extractor hood, all with stainless steel finish, built in fridge freezer and integrated dishwasher. All appliances to be NEFF, excluding white goods. 8. Chrome plated dual controlled mixer taps with pop-up waste to basins and bath. 10. Chrome plated towel rails to bathroom and en-suite. 11. Oak veneer solid core interior doors with polished chrome door furniture. 12. Oak handrail to staircase. 13. Ceramic floor tiling to ground floor excluding lounge. 14. Contemporary torus skirting and architraves. 16. French patio doors to rear. 17. Chrome sockets and switches throughout. 18. Recessed LED down-lighters to hall/kitchen/dining room/landing/bathroom and ensuite. 19. Double pendant to living room. 20. Under unit lighting to kitchen. 21. Dual TV and socket to lounge/dining room and all bedrooms. 22. Telephone socket to lounge. 23. A rated kitchen appliances to reduce water and energy use. 24. 100% LED low energy lighting. 25. Energy efficient A rated combi boiler. 26. Energy efficient double glazed UPVC windows and doors throughout. 28. Multipoint locking system to external doors. 29. Full compliance with Part Q of the Building Regulations. 31. Cast feature stonework to external elevations where shown. 32. Landscaped front garden, patio and turf to rear. 34. Composite GRP feature front door. 37. Electric vehicle rapid charging point. 38. Thermostatic radiator valves to ground floor and first floor. 40. Wireless programmable room thermostat for central heating. 41. External weather compensator to plots 6,7,8 and 9 for greater energy efficiency. 42. 10 Year ICW Structural Warranty. 43. High levels of insulation in roof, walls and floors to limit heat loss in the winter and reduce heat gain in the summer.